I'm new to Hungry Girl and not much of a cook. I want to make healthy meals for my family, but I get overwhelmed by massive ingredient lists. Can you suggest some recipes with only a handful of ingredients? Slow-cooker recipes are ideal for busy folks, and this one is especially easy. Mixing stewed tomatoes with balsamic vinegar was a stroke of genius. So much flavor! 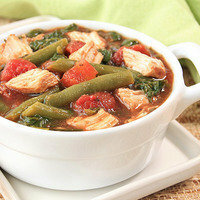 Hearty chicken, green beans, spinach... Throw it all in the pot, and check dinner off your to-do list. Chinese, please! Give your family what they want without ordering greasy takeout. 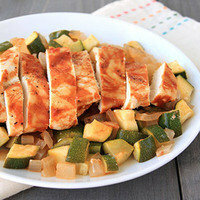 This sweet 'n savory chicken is insanely delicious and so simple to make. I love the crunch the water chestnuts bring, too. Add a side of steamed veggies, and dinner is served. 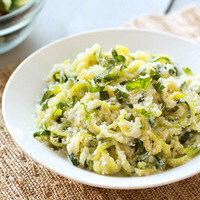 If you haven't cooked with zucchini noodles yet, this take on pasta Alfredo is a great place to start! You'll save hundreds and hundreds of calories. You don't even need a veggie spiralizer... You can make this with a standard veggie peeler. It's a great meatless meal -- check out all that protein! 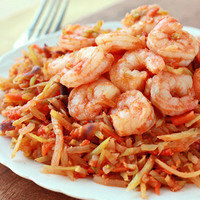 Although, sometimes I toss in precooked shrimp or chicken... So good! 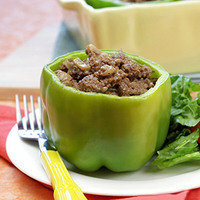 Tossing a cheesesteak-inspired filling inside bell peppers instead of carby hoagie rolls makes for a decadent yet healthy meal! Some people think ground beef is off-limits due to its fatty nature, but the trick is to get the extra-lean kind (4% fat or less). The stats are even more impressive than lean ground turkey! 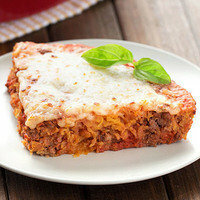 Pair this with salad for a full meal, or enjoy it as a super satisfying snack. I'll raise your five ingredients and give you just two! 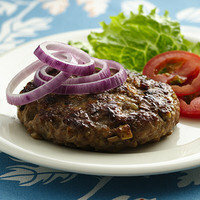 These simple burger patties are shockingly delicious. The onion soup/dip mix is loaded with flavor. Throw your patties onto lettuce buns or 100-calorie flat sandwich rolls. And what's a burger without fries? Add a pile of these baked carrot fries, and your entire meal still has less than five ingredients! Dinner does not get any easier than this seafood-topped pasta swap. Broccoli cole slaw gets all noodle-y and delicious when cooked until soft. Grab some marinara from the pantry and some shrimp from the freezer, and dinner is a go! This recipe serves one, but it's easy to adjust for a group. It's great with chicken too! Hungry for more? Here are eight more meals made with five ingredients or less. And if that's not enough for you, check out Hungry Girl Clean & Hungry for over 40 more! It's National Cook a Sweet Potato Day, February 22nd. Toasty Marshmallow Sweet Potato Skins, anyone? 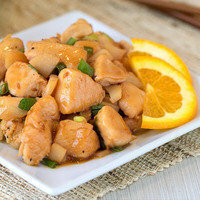 Everyone needs recipes with big flavor and small ingredient lists... Click "Send to a Friend" now!